The building on Clarendon Road cost £12,000 and was opened as the "New County School" on September 17th 1912, by Sir George Dixon, chairman of the County Council. Large extensions to the building were made and opened in 1929 and at that time the name was changed to the "Hyde Grammar School". It was for a time a boys only school (see note in the comments section) and closed its doors to 11 year olds in 1979. When the last intake had progressed to the Sixth Form, it became Hyde Sixth Form College. It later merged with Ashton Sixth Form college to form Tameside College after which it was known as Hyde Clarendon Sixth Form College. Current plans for Tameside College are to transfer all services to a new centre in Ashton under Lyne and then sell the site to a developer for demolition. An e-petition has been launched - Save Hyde Clarendon College from demolition. More photographs of Hyde Grammar School are on Hyde DP Xtra. Old photographs of the school and links to some early videos can be found on Old Hyde. A contribution to the Landmark theme at City Daily Photoblogs. It's a rather crisp looking building. It should be saved and put to some other use. I hope it is saved. Even being turned into condos would be better than tearing it down. It is a nice old school building. Unfortunate that it has become vulnerable. A really lovely school, with an even more lovely front. Love the trees planted alongside the stone fence. Great image too! I just hope that it will be reused and not destroyed. It would be such a shame. Visiting you from City Daily Photo today. Far better if they were to demolish that monstrosity of a building which passes for council offices in Wellington Road, Ashton - and while they are at it they can return the civic regalia and everything else they've plundered from Hyde since they set up the Socialist Republic of Ashton-Under-Lyne which masquerades under the title of Tameside Metropolitan Borough Council. I hope it appreciates all those name changes. "It was a boys only school" is strictly incorrect as it was a mixed (boys and girls) school until the late 1950s. 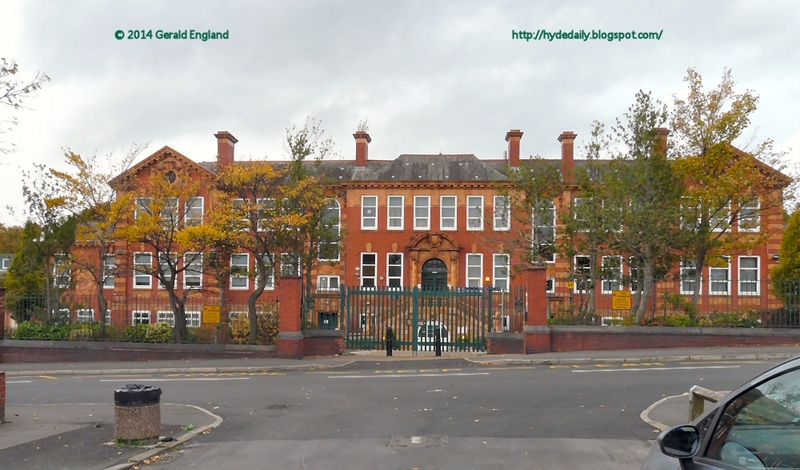 Astley Grammar School (all girls), in Dukinfield, had been built in the mid 1950s and, I believe, received its first intake, in about 1956, when the younger girls (11,12,13) from Hyde Grammar transferred to there, also. The older girls (14,15,16) at Hyde, remained there and, by about 1960, the last girls (from the Sixth Form) had left. Thanks for the information - I've changed the text to reflect this information. A brief history of the CDPB movement with links to over 250 photoblogs.